In the latest episode of the Windows Weekly podcast, Leo and I discuss some New Year resolutions, a look back at 2010, a look forward to 2011, some CES predictions, Windows Phone data usage issues, and Paul's weekend PC focus group. My favorite weather app, with live tile updates, multiple location support, and nice customization features. Also: Ilomilo was last week's pick. Play blockbuster video games without a console or massive downloads. If it works for you, you can go the hardware route too. But its free to try on the PC. Plus they're having a big sale for CES. This makes it much easier to use different Xbox 360 consoles. But with some games, there's a small gotcha. There are two backup locations now, and you should be using both: Local backup (in-home) and cloud-backup. This is the year. Don't be a statistic. 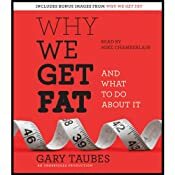 "Taubes argued that our diet’s overemphasis on certain kinds of carbohydrates—not fats and not simply excess calories—has led directly to the obesity epidemic we face today." I love this book because it does for weight loss what I like to do in my own field: Push aside the conventional wisdom, which is often wrong, and explain what's really happening. This is a must-read for anyone that's struggled with weight loss, and my guide for this next year.